TP-Link has launched its TL-WA855RE Wi-Fi range extender at a price of Rs 2,999, exclusively on Amazon India. The device will help users overcome Wi-Fi dead zones and is capable of offering speeds of up to 300Mbps. TP-Link’s new Wi-Fi extender delivers 802.11ac performance and comes with two external high-gain antennae. The company claims that it boosts Wi-Fi signal so that it can pass through thick walls and ceilings. The TL-WA855RE has a compact wall-plug design, along with LED indicator lights on the front to guide the user towards the location with best Wi-Fi signal strength. “The two external antennae with MIMO technology enhance users’ network by dramatically increasing wireless speeds and signals in Wi-Fi dead spots.” said Lynn Wang – VP SOHO at TP-LINK India. The device helps in strengthening the Wi-Fi signal coming from any router. It plugs into a regular electrical socket and boosts a network’s wireless signal to extend coverage. 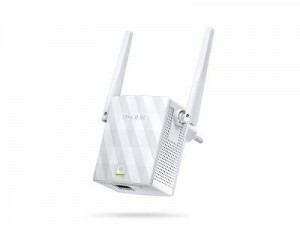 In addition, it can also be used to create a Wi-Fi access point. Few months back, Netgear launched its AC1200 Wi-Fi range extender EX6120 at a price of Rs 5,500. The company claimed streaming speeds of up to 1,200Mbps. The EX6120 features 802.11ac technology and makes simultaneous use of dual 5GHz and 2.4GHz bands to reduce interference.